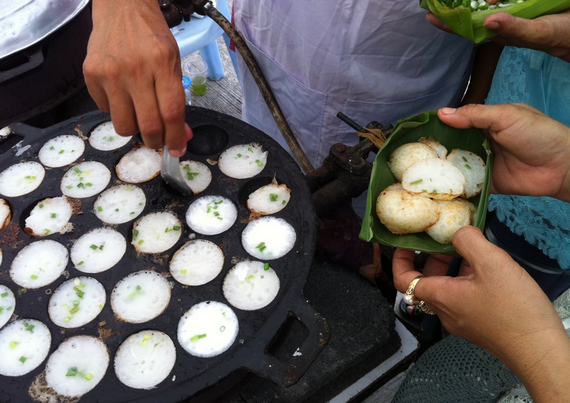 Thailand is one of the best places in the world to eat on the street. 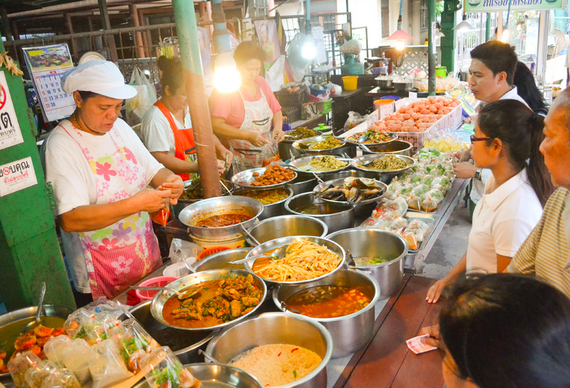 It’s cheap, it’s fresh, and the mix of distinctive southeastern flavors — chili, lime, lemongrass, mmm — reaches an unparalleled peak of covetable deliciousness in the simmering pots and hand-pushed carts of bustling Bangkok. 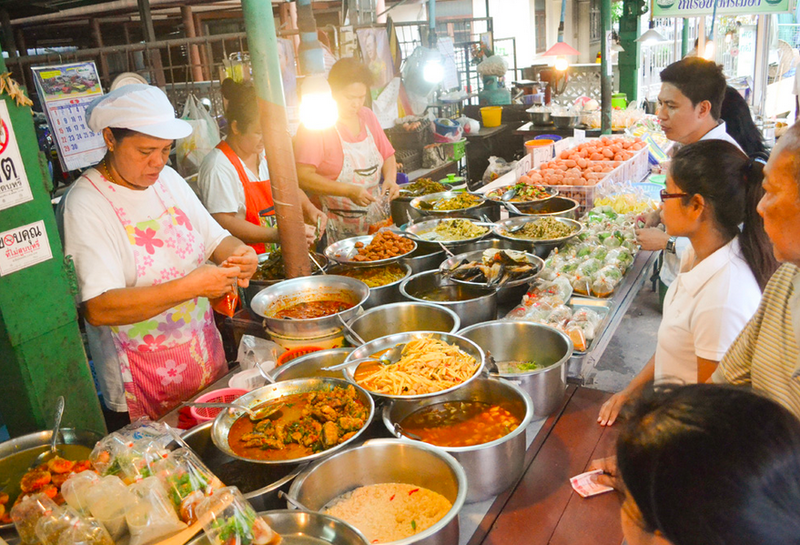 With so many mystery meats, crazy colors, and mouth-watering choices, it can be hard to pick which dish to spend your baht on, though. Fret no more, we’ve made it easy for you. 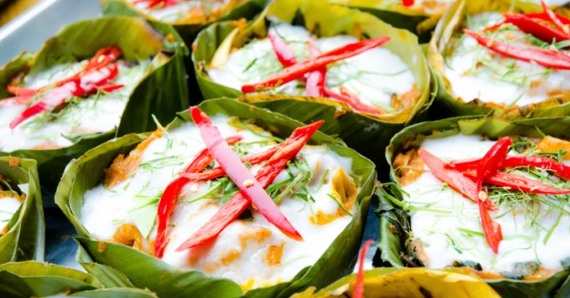 Below, 5 can’t-miss-‘em street food dishes to make sure you sample your next time you step through this gateway city. 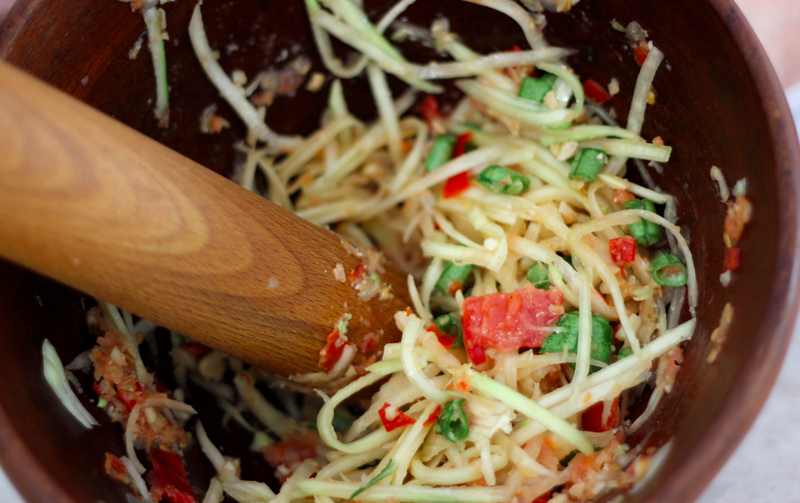 You’ve probably already heard of papaya salad (“som tam” in Thailand), but you’ve never really had it until you’ve eaten it, freshly mixed, from a street cart. 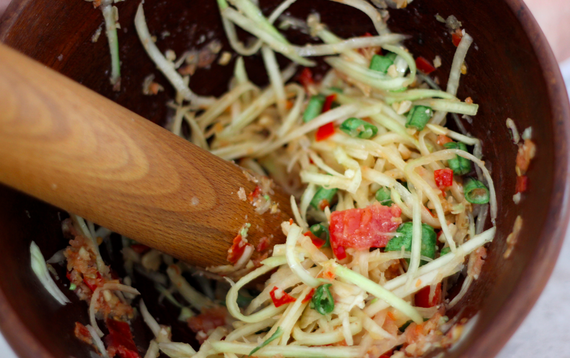 A savory combination of shredded unripened papaya, shrimp, peanuts, and blistering chilis, this dish will have your mouth on fire — and keep you comin’ back for more. The vendor will often ask how many chilis you want (one, two, or three). For newbies, we suggest one. Trust us. A lot of food in this city comes wrapped in banana leaves. Often, you don’t know what you’re getting until you take the first bite. (It’s own kind of exciting adventure.) These fish cups, though, are the ultimate. 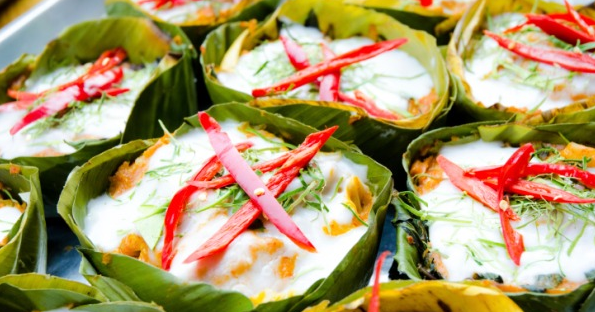 Open-faced, filled with herbs, fish, and a smoky red curry paste, they’re a perfectly satisfying salty treat. Bonus: they’re topped with a layer of sweet coconut cream. The best part about eating these tiny, protein-rich treats is watching them get made. Seasoned street vendors cook them over high-heat in cast iron skillets, then serve them up, still warm, with a little salt and hot sauce. One of the simpler joys; truly classic comfort food. 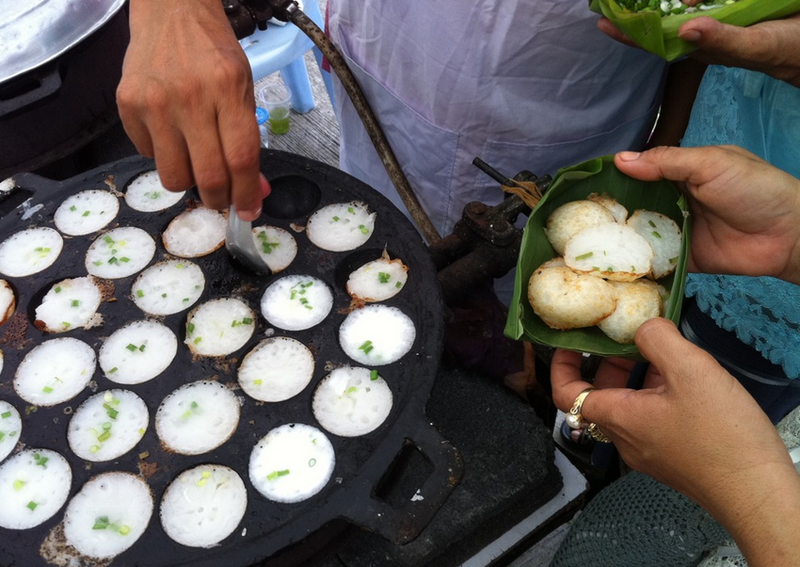 Speaking of those cast iron skillets… there’s few desserts in Thailand like these coconut-cream filled pancakes. Cooked to an exterior crisp over an open flame, then pinched closed over a chewy coconut interior, they’re a perfectly textured bite of sweet, creamy goodness. It’s usually 8 to an order, but you’ll probably want to go back for seconds. 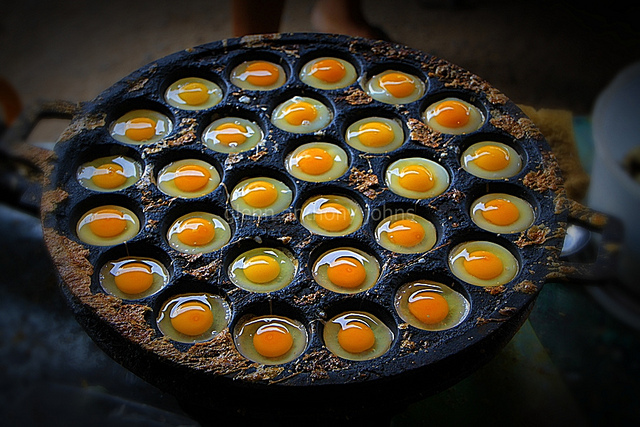 Truly, the most addicting of all Thai street food.